As summer weather fades into fall, a new crop of pollen is set loose across the country, activating fall allergy symptoms for an estimated 40 million Americans, according to the Asthma and Allergy Foundation of America. Ragweed is the primary allergen in fall, according to Warner Carr, MD, an allergist and fellow of the American College of Allergy, Asthma and Immunology. If you’re experiencing seasonal allergy symptoms such as itchy, watery eyes, a runny nose and a sore throat, it’s not the ragweed in your yard or your neighbor’s yard that’s to blame, either, Dr. Carr emphasized. “Pollen blankets an entire area like smoke from a fire,” he explained. Your first line of defense against allergies is over-the-counter nasal antihistamines and other medications that treat your specific symptoms. But the best way to fight seasonal allergies over the long-term is to see an allergist for an accurate diagnosis, and perhaps immunotherapy or allergy shots. Allergy shots routinely expose patients to their allergens a little bit at a time, eventually offering long-term remission of allergy symptoms, Dr. Carr said. Rain often washes pollen out of the environment, but first, it bursts pollen particles, spreading allergens farther, Dr. Carr said. Then, there’s an allergic reaction in the lungs, causing asthma symptoms, or for those without asthma, allergy symptoms in the upper airways, he said. Ninety-five percent of people with asthma also have allergies, Dr. Carr said. Rainstorms can produce serious respiratory symptoms for them, so patients should anticipate this, and be prepared with the proper asthma and/or allergy medication. A sore throat might not seem like a symptom of allergies, but it definitely is, Dr. Carr said. The reason is simple: When you have allergens in your airways, your nose runs, creating a nasal drip that seeps in your throat, irritating the skin there, Dr. Carr explained. You can treat your sore throat with over-the-counter medications, and stop nasal drip with antihistamines from your local pharmacy, Dr. Carr said. If symptoms persist, seek medical advice — you might need a prescription nasal spray, or another form of treatment to soothe your symptoms. It’s possible to develop any type of allergy at any point in your life, according to ACAAI data. “Allergies are on the rise, so patients should be on the lookout for troublesome symptoms,” Dr. Carr said. In children, boys more commonly develop allergies. As adults, women more commonly develop allergies, suggesting hormones might play a role in allergy onset. Moving to a new region that has higher pollen counts than you’re used to can also bring out allergy symptoms in adults. Symptoms include sneezing, a runny nose and itchy, watery eyes with no fever. A fever indicates the common cold, but cold symptoms without a fever could be allergies, Dr. Carr explained. 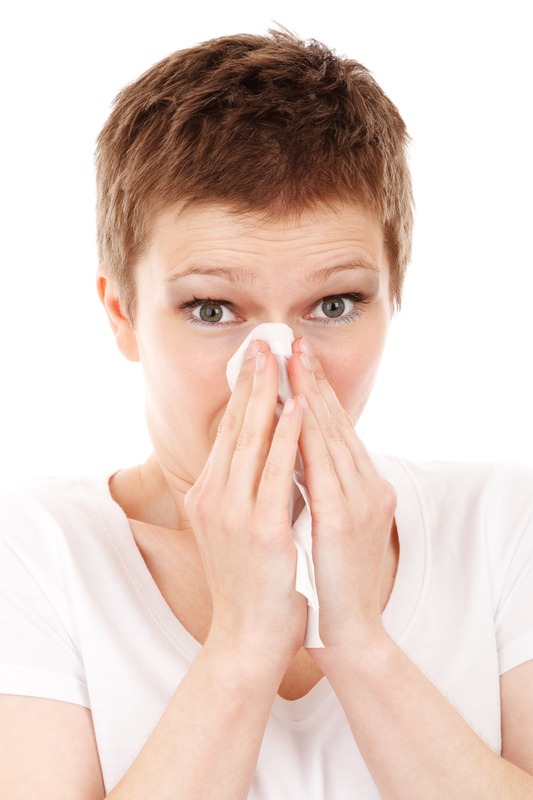 To find out what’s really bothering you, you should get a test from an allergist. This year allergies are particularly bad, thanks to record rain in parts of the South and Northeast. The length of the allergy season is also an issue. Just because the season started earlier, doesn’t mean it will end earlier. This is on par with the larger allergy trend: Every year, pollen counts are getting higher and higher, said Dr. Carr. But there are different theories as to why. When summer weather fades, cold and allergy season hit, prompting some people to wonder if they’re experiencing the common cold or seasonal allergies. Symptoms include sneezing, a runny nose and itchy, watery eyes with no fever. A fever indicates the common cold, but cold symptoms without a fever typically mean allergies, Dr. Carr explained. To find out what’s really bothering you, you should see a doctor for a treatment plan. It might also be allergies if you feel worse after any time spent outside, or if symptoms lasts for days or even weeks without responding to medication. For the fourth year, Weather.com and The Weather Channel have teamed up with the Asthma and Allergy Foundation of America (AAFA) to release the Fall Allergy Capitals of America. As we enter the drier days of fall and leaves start dropping, don’t look for pollen levels to drop.